Metropolitan touring invites the discerning traveller to an exciting and spectacular country that is keen to open its arms and reveal the heart and soul of its proud colonial heritage and indigenous tradition. Experience seven diverse destinations visiting the most amazing places in Colombia. This tour will revitalise the senses of the most seasoned traveller. Acclimatise in the heart beat of Colombia that is Bogotá where this vibrant city offers excellent dining and sightseeing. From Bogotá travel until the aroma of coffee announces the arrival of the coffee region. The heights of this region give way to the coast of the Caribbean and the magnificent colonial city of Cartagena where time is spent at a leisurely pace soaking in the sun and history of this UNESCO World Heritage site. Colombia offers a myriad of experiences for the visitor to encounter. Visit the pulsating cities of Bogotá and Medellin where one can be surprised at these progressive cities with modern commercial and fine dining zones. Go beyond your expectations and see the magnificent and mysterious structures of San Augustín and then trek along the foothills of the Andes. Walk along cobbled alleys of the walled port of Cartagena where overhanging and flower adorned balconies are a welcome shelter from the sun. Live an amazing experience passing through Bogotá, a modern fast growing city and one of Latin America’s urban highlights with a thriving nightlife, superb dining and al fresco café and bar culture. 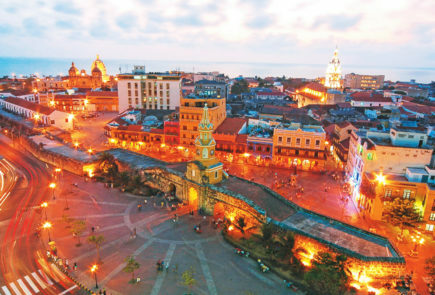 This is contrasted with Cartagena where this charming city will capture the heart and mind of any traveller, from its well preserved colonial architecture, romantic atmosphere, vibrant flora, excellent cuisine and amazing sunsets, to its warm and inviting people. Step into the footprints of the first Spanish adventurers and discover their influence on this land. Colonial history is scattered across Colombia and some of the finest examples are at Villa de Leyva where time has stood still in this well preserved national monument. Visit Barichara and Girón where quaint whitewashed houses close in on cobbled streets; these are further fine examples of colonial towns. Cartagena is probably the most recognized colonial city hugging the Caribbean coast where visitors can take in the history with the sun on their backs. If one wants to follow in the footsteps of an ancient civilization, there’s no place better than Colombia. The Vestiges of the Past tour takes the traveller back in time to the legend of ‘El Dorado’. Explore Lake Guatavita where the ‘Golden One’ would summon the gods by leaping into the lake. Step further back in time and visit San Augustín where hundreds of carved stone statues stand in silence revealing the mysteries of a lost civilization. The Amazon conjures up a sense of adventure for travellers yearning to visit and support this natural wonder. An immense biodiversity brimming with fauna and flora is only a leisurely boat ride away from Leticia. This tour takes in the urban expanse of Bogotá, the legendary El Dorado site of Guatavita and finally to green and lush vastness of The Amazon. Swim with pink river dolphins and trek in the rainforest and discover for yourself the Lungs of the Earth.